Climate change activists climbed on a train and glued themselves to the carriage in the third day of protests aiming to “shut down London”. Wednesday’s action – affecting a Docklands Light Railway (DLR) train at Canary Wharf – caused minor delays. More than 300 people have been arrested this week over the protests. A campaigner who had glued himself to the train’s window was removed about an hour after the start of the DLR protest, at about 10:50 BST. 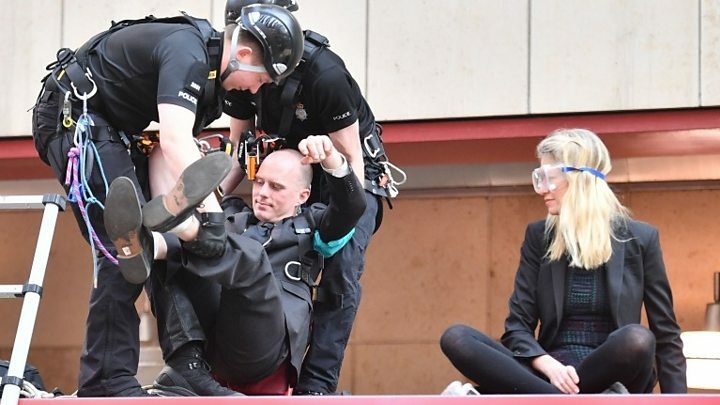 A man and a woman who unfurled a banner and glued themselves to the top of the train’s carriage were also later removed and carried off by officers. Extinction Rebellion targeted the DLR on Wednesday after protesters changed their minds about disrupting the Tube network. Earlier, BTP ordered Transport for London (TfL) to switch off wi-fi at Tube stations in an attempt to deter protests. Scotland Yard said protesters were being removed from Waterloo Bridge, adding those who did not comply would be arrested. Most of the people arrested so far have been held in connection with public order offences. Protester and climate lawyer Farhana Yamin, who was arrested on Tuesday, earlier told BBC Radio 4’s Today programme: “I totally want to apologise to people using public transport. Jace Tyrrell, chief executive of the New West End Company, said the first two days of protests had so far caused a loss of £12m in trade in the West End. Organisers said protests had been held in more than 80 cities across 33 countries and wanted to continue “shutting down London” until 29 April. Campaigners at Waterloo Bridge and Oxford Circus have been ordered to restrict their protests to Marble Arch after they caused widespread disruption on Monday. That order will continue until 21:10 on Friday. Joao Verga, who works at a printing company, says the protesters at Oxford Circus have caused him disruption. Three men and two women, in their 40s and 50s, arrested on suspicion of criminal damage at Shell’s headquarters in London on Monday, have since been released while inquiries continue. Controversial music artiste, Speed Darlington, has been one of Bobrisky’s arch enemies on the internet but now another fresh clash has started after Bobrisky leaked their chat.